Try these yummy pomegranate recipes to give your morning a boost! Pomegranate Recipes That Makes a Great Antioxidant Smoothie! Why learn how to make pomegranate recipes? 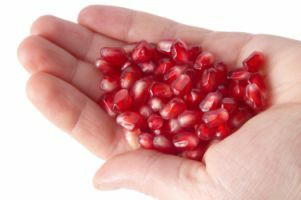 Why do so many people drink pomegranate juice and take pomegranate supplements? Pomegranates are full of antioxidants. Antioxidants have been the “in” thing these days in the health industry. But are they really THAT great? There is validity in the fact that antioxidants will go into the body and fight the free radicals that are plundering our bodies. But is that true health? Would we be healthy if all we drank was a glass of juice with some supplements? There is more to health than taking extra antioxidants. Vital nutrients need to be apart of our daily menu. Such as phytonutrients. Yes, we need antioxidants. But don’t focus solely on them. Here are some pomegranate recipes that I have made and loved. These smoothies give you the benefit of both the antioxidants and phytonutrients. To get even more nutrients in these smoothie recipes make it a green smoothie! In these recipes, I used frozen pomegranate kernels, which I got from the freezer section in my local co-op. They are more expensive then blueberries. But if you would like to pick apart a fresh pomegranate to get a cup of pomegranate kernels, be my guest. Don’t think your store has them? You should look... I live in northern Minnesota, and I found them. They are probably hiding in the health food freezer section. Another option is to use pomegranate juice. Which is also tasty. If you do use juice instead of the frozen fruit, make sure to add some ice or other type of frozen fruit to chill the smoothie. 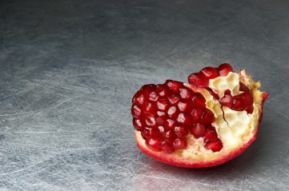 One thing about pomegranates is that they have a tiny seed inside each of the kernels. When you blend up your smoothie, blend extra long to minimize the amount of seeds you will be chewing. Have fun using different amounts of ingredients. Use more stevia, dates, or juice if you need them to be sweeter. These smoothies blend up into a pretty pastel purple color. And taste great!